In June, there were at least 3 protest-related cases under NCPO Order No.7/2557 (2014). The Order, which was issued according to the power granted by the Martial Law, prohibited a political assembly of five people or more. In addition, there were at least 4 new cases based on NCPO Chairman Order No. 3/2558 (2015) no. 12. The Order, which also prohibited a political assembly of five people or more, was issued according to the power granted by Article 44 of the Interim Constitution. 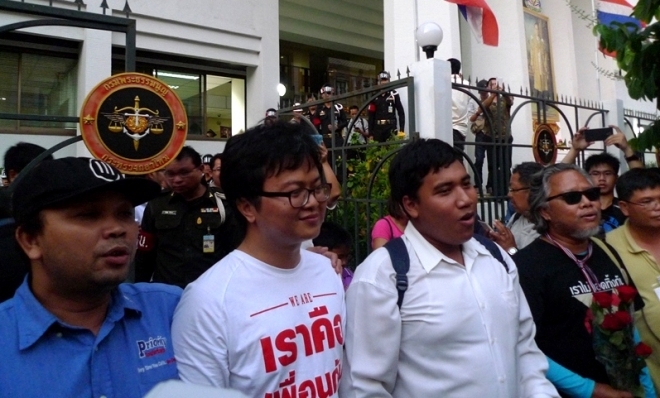 4 June – The military prosecutor ordered to prosecute Arnon, Pansak, Siriwit, and Wannakiat defendants of the my dear election case for defied NCPO Order No. 7/2557. All defendants were released on bail by the Bangkok Military Court with cash deposit in the sum of 10,000 Baht each. 19 June – The military prosecutor ordered to prosecute Pansak (A March for Justice Case) for defied NCPO Order No. 7/2557, Section 116 of the Criminal Code or sedition and Section 14 of the Computer-related Crime Act. The Military Court released Pansak on bail with cash deposit in the sum of 70,000 Baht. Both cases were the result of My Dear Election activity held in front of the Bangkok Art and Culture Center on 14 February 2015 to commemorate the 2 February 2014 election which is the last election prior to the coup on 22 May 2014. 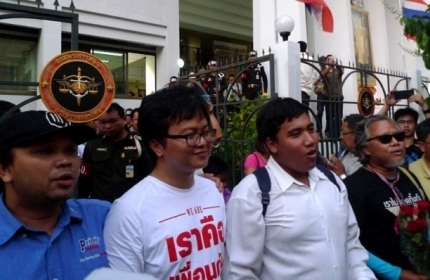 Defendant in the "My Dear Election Case (from left to right) Wannakiat, Arnon, Siriwit and Wannakiat "
10 June – The Pathumwan District Court scheduled for an examination of evidence of Apichat’s case. Apichat was the first person being prosecuted for defying NCPO Order No. 7/2557 (prohibiting a political assembly of 5 people or more) after taking part in a protest against the coup in front of the BACC on 23 May 2015. The Court scheduled the first round of witness examination on 11 September 2015. After the protest on the occasion of 2014 coup anniversary on 22 May 2015, the authority arrested 38 students in Bangkok and 13 students in Khon Kaen. Later on, 9 student who protested at the BACC and 7 "Daodin" student who protest in Khonkhean province were informed of charge. 8 June – Pathumwan District’s inquiry officials summoned 9 students alledgly defied the order of the head of NCPO no. 3/2558 (2015)to report at the police station. Similarly, official at the Khonkhean Police Station also summoned 7 Daodin students to report. 19 June – This day was the deadline that the student and activists in Bangkok and in Khon Kaen need to report to the Police. If they fail to comply within the deadline, the police can immedietly ask the court to issue arrest warrant against them. However, the student and activists insisted that they won't report to the police. 22 June – Thachapong or Chatchai, activists who were arrested in front of the BACC went to report to the Pathumwan Police Station. At 1.30 PM, he was sent to the court where the pre-trial detention order will be issue. The Military Court later granted him on bail with a deposit in the sum of 10,000 Baht with a condition not to take part in political activity or express his political opinion to the public. 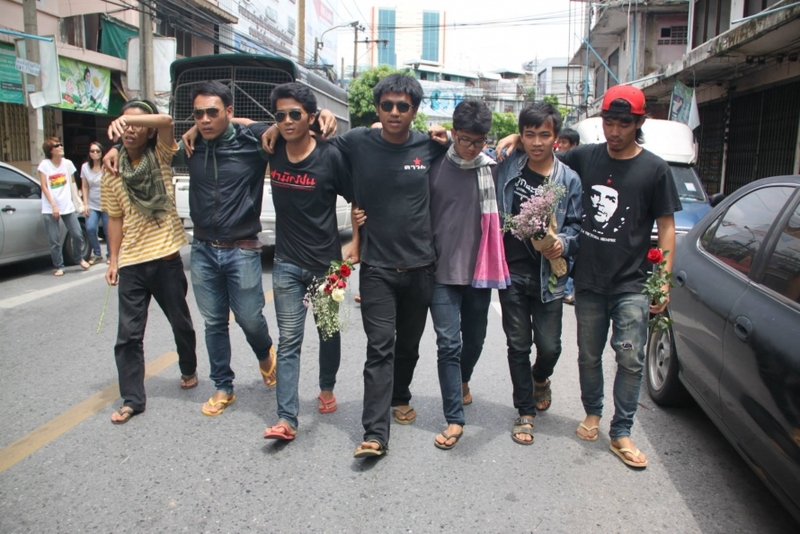 24 June – activists who were arrested in front of the BACC, together with their supporters, marched to Pathumwan Police Station to file a complaint against officials who physically assulted them during the arrest on 22 May 2015. 7 Daodin students also came to show their support at the police station. 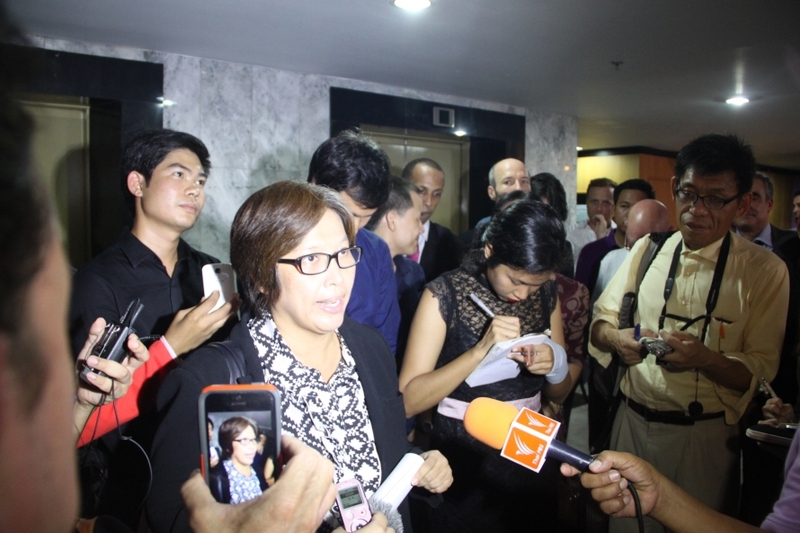 The complaint was filed by activists who were at the BACC on 22 May but wasnt listed on the arrest warrant. A gathering in front of the Pathumwan Police Station lasted until 9.40 PM. No one were arrested on the date. However, plaint cloth officials had followed the protesters to their residences and monitored their activities for 24 hours. In the same morning, officials from Pathumwan Police Station arrested Natchacha while she was hospitalized in Vipavadee Hospital. Natchacha was brought to the Military Court at 1 pm where the police will file petition for pre-trial detention. Natchacha challenged the petition, her study and well as her madical concern were used as reasons for challenging. Natchacha also raised that she had gone throught transgender operation hence to be detain in male prision seem to be inappropriate. The Military Court however authorized pre-trail order on the ground that Natchacha had her supporters, she might further provoke disorder in the society. The Court later released Natchacha on bail with cash deposit in the sum of 10,000 Baht. She was released from the Bangkok Remanded Prison (prison for male) in the evening of the same day. 25 June - The New Democracy Movement which was the gathering of the Daodin student from Khon Kaen and the activists who protested in front of the BACC on 22 May 2015 traveled from their temporary residence at Suan Ngen Mee Ma to 6 October Sculptures Memorial at Thammasat University before marched to May Massacre Memorial, 14 October Memorial then to the Democracy Monument. The activity lasted until 7 pm. No one were arrested on the date. However, plaint cloths officials were followed them back to their residences as happen earlier. An Arbitary Arrest, A Night Time Trial at the Military Court and the Prosecution against Activists with Sedition Charge. 26 June – Around 5.15 pm, more than 50 police and military officials (both in uniforms and plaint cloth) went to Suan Ngen Mee Ma with an arrest warrant issued by the Bangkok Military Court on 26 June 2015. The warrant were present to 14 student and activists. The accusation according to the warrant incliding the defying of Order of the Head of the NCPO No. 3/2558 (2015) no. 12 and Section 116 of the Criminal Code or sedition. All 14 did not resist the arrest. They were later taken to Phra Rajchawang Police Station. At 9.35 pm, police officials brought 14 student and activists of the New Democracy Movement to the Military Court where petition for pre-trial detention will be file. The Military Court started the proceeding at 10.52 pm. All 14 challenged the petition on the ground that it was unnecessary since they never resist the arrest and on the ground that the underlying legal basis for detention is unjust. In addition, at the time of arrest, the police did not notify them of their rights, and thus against their right to Due Process. The students also claimed that the Military Court did not have jurisdiction to try civilian's cases. During the proceeding, The Military Court only allowed the 14 and their lawyers to be in the court room while observers were not allow to access the court room. At 00.15 am, the Military Court authorized the pre-trial detention order for a period of 12 days. All student and activists decided not to file a petition for bail. 13 male student and activists will be remanded at the Bangkok Remand Prison while a female student will be remanded at The Central Women's Correctional. In the night time after the proceeding, police officials informed the lawyer that they wish to search one of the lawyer's car parked in front of the Military Court. The police believed mobile phones of the detained student and activists were kept in there. The lawyer however refused to allow the search on the ground that the officials did not have a search warrant. The police officials wanted to move the car to the Chana Songkram Police Station, but ultimately failed to move the car due to technical reasons. At the end, the officials locked the wheels, sealed the doors, and sent officials to watch over the car as they waited for the search warrant. The search was conducted in the morning of the later day. The lawyer also slept in front of the Military Court to make sure that the police will not try to search the car without the warrant or the lawyer presence. 29 June – The military prosecutor ordered to prosecute Natchacha and Tachapong for defying the order of the head of the NCPO No. 3/2558 (2015), the charge was due to their participation in a protest in front of the BACC on 22 May 2015. The Military Court released both on bail with cash deposit in the sum of 10,000 Baht. The court also set a condition, prohibiting both from protesting or encouraging others to protest. Chaing Mai Military Court Dismissed a charge against the journalist who publicized a photo of a protest against the Coup. There was at least 4 new 112 case in this month and at least 2 cases involving the excercise of the right to freedom of expression. Since the coup on 22 May 2015 to 30 June 2015, there were at least 51 people being accused to committed offense against Article 112 of the Criminal Code from exercising their right to freedom of expression. 9 June - The Chiang Mai Military Court read a verdict, dismissed the incitement charge under section 116 of the Criminal Code against Chatchawan who accused to publicized pictures of a protest against the coup in Lumpoon Province and mentioned the date incorectly. The Court dismissed the charge on the ground that the defendant only report what is happening and the prosecution failed to prove beyond doubt that the defendant intended to raise confusion or incite the people to disobey the law. 23 June – Police officials from Technology Crime Suppression Division, military officials, and National Security Agencies arrested Chayapa a woman who was accused of posting a rumor about a double coup on Facebook at her house in Samutprakarn Province. After being investigated by the police, Chayapa was also found to post content defaming the monarchy on her Facebook account. Officials brought Chayapa to the Bangkok Military Court on 25 June 2015. The court approved petition for pre-trial detention filed by the police in the same day. Chayapa is detained at the central female correction center. 8 June – The Nonthaburi Provincial Court set to examine Charnwit’s deposition.Charnwit pleaded not guilty. The Court scheduled the first witness examination on 15 September 2015. 9 June – The Chiangmai Military Court set to examine Sasivimol’s deposition.Sasivimol pleaded not guilty. The Court scheduled an examination of evidences and witnesses on 8 July 2015. 26 June – For Pongsak’s case, the defendant asked the Bangkok Military Court to postpone the deposition examination because he wanted to consult with his lawyer. The court set the new date for deposition examination on 7 August 2015. As for the case of Samak and Bundit’s cases, the examination of witnesses have not been completed yet. In June, there were at least 6 activities that were cancled or intervened by the officials. Seminars hosted at or organized by the FCCT were cancle 3 times. Since the coup, at least 85 activities were cancled or interfered by the authorities. 4 June – The Thai Lawyers for Human Rights Center organized a public forum on the human rights situation during a period of one year after the coup. In the morning of the day, FCCT, owner of the venue was asked by the officials not to lend the venue for organizing the activity. The officials notified FCCT that, if it proceed with the event, the officials would block the entrance of the building. Jonathan Head, President of the FCCT said that, if the NCPO would like to cancel the event, they need to present official order in letter. The authorities later issued a written order, the Thai Lawyers for Human Rights Center then held a short press conference in front of the FCCT. Representatives of the Thai Lawyer for Human Rights Center held a press conference in front of the FCCT after their event was cancle by the NCPO order. 17 June – The seminar organized by FCCT entitled “Article 112: Its role in Thai society” including speakers like Sulak Sivaraksa, David Streckfuss, Satish Sehgal, and Sukanya Pruksakasemsuk was canceled. Two days prior to the event, FCCT announced that police officers have passed on NCPO’s order to cancel the event. If the FCCT decided to continue, the police officials would bring force to block the FCCT building. The police officials however only passed on the order verbally because the NCPO refused to issue a written order. 26 June – Authorities "asked" FCCT for a cooperation to cancle a press conference to release a report entitled “Vietnam: End Evil Way: Persecution of Montagnard Christians”, which concerns the violation against rights of minority groups in Vietnam organized by Human Rights Watch. The authorities claimed that the event might had negative effect on national security as well as effected the relation between Thailand and Vietnam. The FCCT requested a written order from the authorities. After receiving the written order, Sunai Pasuk, representative of Human Rights Watch Thailand announced to cancele the event and showed the written order to the press. 28 June – Military officials from Sri Songrak Camp in Loei Province ordered officers from the Developing New Generation for Social Change Project under the Thai Volunteer Service Foundation to cancel the “Youth Loves Hometown” Camp. The officials claimed that the situation in Wangsapoong District in Loei Province was not normal. The officials were afraid that Daodin students might join the activity and encourage the participants to protest against the government and create division among the villagers. In addition, authorities also intervened in a seminar about the Constitution organized by Ramkamhaeng students as well as intervened in 2 meetings of villagers in rural areas – a meeting of the Assembly of the Poor at the Community Learning Center (Nong Yai Toe sub district, Lopburi Province) as well as an event organized by NGO in the South. Authorities continued to summoned individuals and activists for "Attitude Adjustment". Those who have been summoned include environmental activist such as Dong Mul conversation group, Panthep Puapongpan from the Energy Reform Network and Federation of Northern Farmers. Politicians such as Jaturon Chaisaeng, Jatuporn Prompan, Nattavudth Saikae, Thaworn Sennium, Wattana Maungsuk were also summoned for a discussion with the NCPO at Royal Thai Army Club, Viphavadi. Besides the summoning of activists, military officials also changed their method of information gathering. They went to residences of the targeted individuals either with appointment or without. It was reported that military officials from various stations had paid a visit to relatives of 16 activists who are part of the New Democracy Movements. Conversation between the authorities and the relatives were vary, some were persuaded to convince their children to turn themselves in while some were threatening. Education was an issue that the authorities usually used to threat activists as well as their relatives. In June 2015, at least 33 indivisuals were summoned to report. Since the coup until June 2015, at least 722 individuals had been summoned.